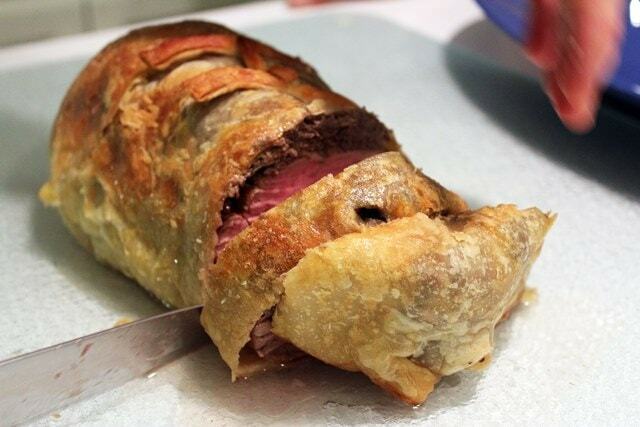 Remember at Chrismas-ish time when I made these super duper cute individual beef wellingtons? I made a big one! THAT was great too. I actually made this for Christmas with Jay’s family. They eat beef Tendahhhhhloin (they’re southern, it’s OK) every Christmas, and this was a fun twist on it. Because…..it has pastry in it. It was SUPER easy to make ahead, too. We made it at our house and then just baked it once we were all together. For quantities, you’ll need to play this by ear. I’d portion 1/4 pound of meat per person to allow leftovers (since you’re eating the pastry too 1/4 pound of just beef is a LOT), and you might make two smaller Wellingtons or 1 large one. I found that for my gang of 15 people 5 pounds of meat was MORE than enough, and it fit nicely into two smaller wellingtons about 6 inches long each. Just portion the pastry and mushroom mixture accordingly – yours might not look exactly like mine! These DO bake longer than the small versions, so allow time for that. Just like with the mini guys, I seared the meat, let it rest, made the duxelles (mushroom mixture) then stretched out the puff pastry. And elegantly rolled it out with the most expensive rolling pin ever. AKA off-brand cooking spray. This is my real life, kids. 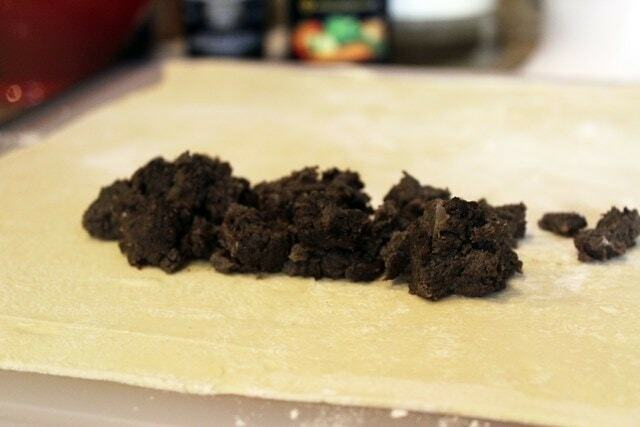 Then, you plop some of the mushroom mixture (or all of it if you’re just making one Wellington) on the puff pastry. Then top the duxelles with the beef! 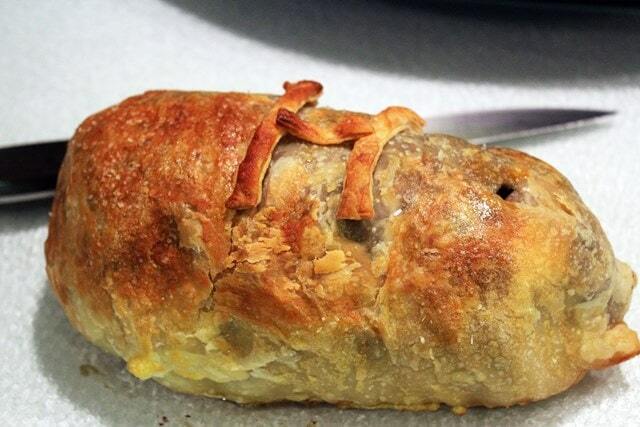 …and crimp the edges of the pastry together then invert the wellington so that the seam of the pastry is down. If there are extra pastry edges, cut them off and save them for something else! 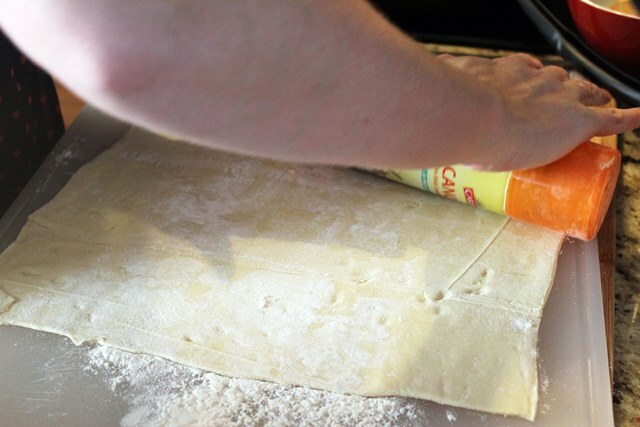 Spray the pastry with cooking spray or brush with egg wash, then sprinkle it with salt for a nice crunch. To bake, you’ll preheat the oven to 425F then bake the pastries for 40 – 60 minutes until the beef is done to your liking and the pastry is crisped and golden. We like our meat medium-rare, so 135 – 145F internal temperature was our goal. The tenderloin will cook about 5 more degrees after it comes out of the oven, too. Use a meat thermometer to check the temperature right at the center of the beef to know if it’s ready or not. Look! I made our initial on it with extra pastry. Be VERY sure to allow time for the wellington to rest. Make the sauce during this time – it’s in the recipe below for ya. This isn’t an “eat piping hot dish,” if you do that the meat juices will run everywhere. We let this rest for 20 minutes and that STILL happened! When you area ready to eat, though, carve this into slices an inch or so thick, and serve with your favorite holiday-meal-sides. Enjoy this one, friends! It’s a great slightly-fancy meal, and is a huge hit with everyone. Happy Easter weekend! Preheat a large skillet to medium-high heat with a drizzle of olive oil. Tie the tenderloin at several places to hold the shape with kitchen string. Sprinkle salt and pepper all over the beef tenderloin, and sear the meat on all sides for about 4 minutes per side until a crust forms. Remove from the pan and let rest for at least 15 minutes until cool. Reduce the heat in the same pan to medium heat. Meanwhile, prepare the duxelles. Pulse together mushrooms, garlic, and onion in a food processor until very finely chopped. Cook the mushroom mixture with a sprinkle of salt and pepper in the pan that you used to sear the meat for 10 - 15 minutes until dried out and very dark. Reserve the pan! Assemble the Wellingtons. 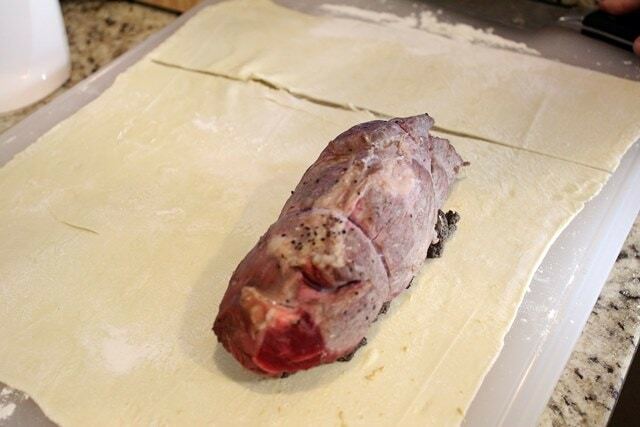 Remove the string from the tenderloin, and lightly press out one or two sheets of puff pastry to stretch slightly. 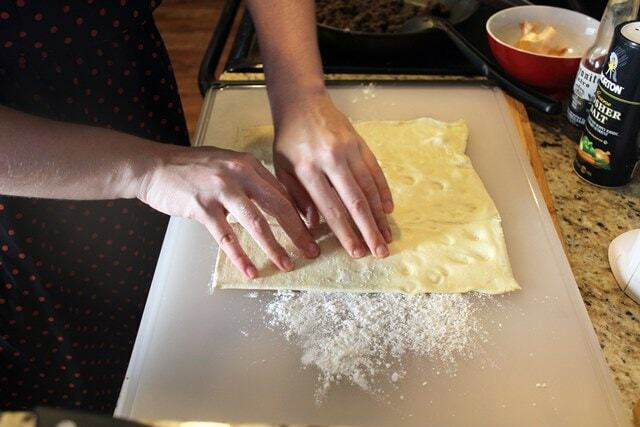 You may only need one sheet of pastry, or 1.5. 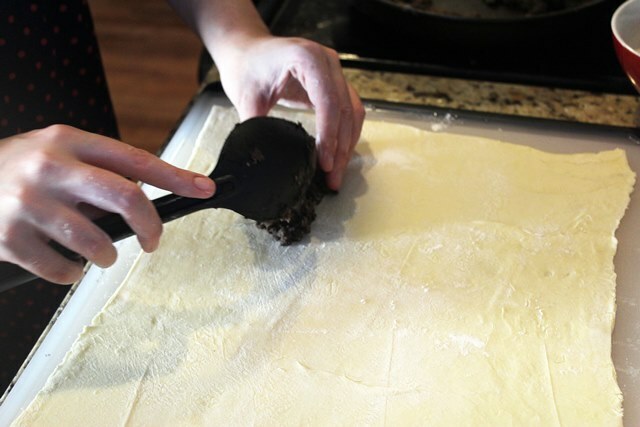 Roll out the puff pastry just a bit, then place the mushroom mixture in the center of the puff pastry, or divide it evenly among two pieces of pastry if you're making two smaller Wellingtons. 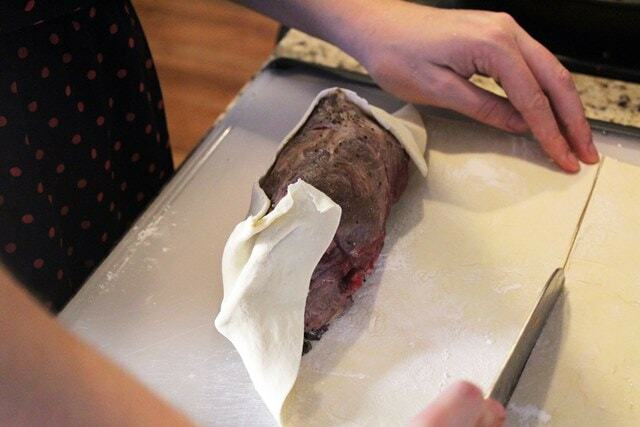 Place the beef on top of the duxelles, then pull the pastry gently over the beef to form a package. Press the pastry together to seal, then invert the pastry (so the mushroom layer is on top), seam side down. 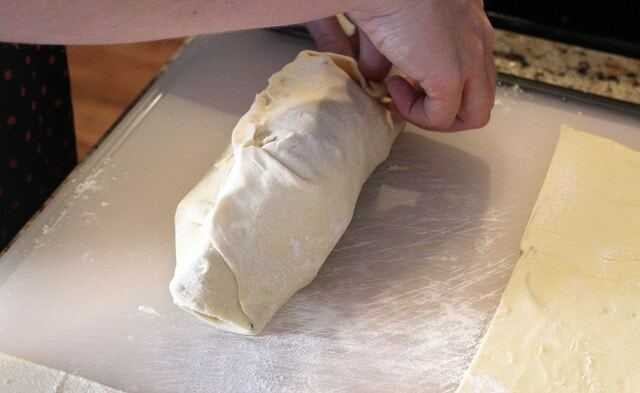 Trim away and save any extra pastry for another use. Spray with cooking spray and sprinkle the pastry with coarse salt. When ready to bake, preheat the oven to 425F. Bake for 40 - 60 minutes until the pastry is golden and puffed and the internal temperature of the meat is 140F for medium rare. Let sit for at least 15 minutes to rest while you make the sauce. Make the sauce. In the same pan you used to sear the meat and cook the mushrooms, add the butter over medium heat. When the butter melts and foams, add the flour and whisk together. Let the flour cook for 1 minute, then whisk in the wine. Add the beef stock, and stir to combine very well. Increase the heat to medium-high and let the sauce bubble and thicken for 2 minutes or so. Taste, and add salt and pepper to your taste. Cut the beef wellington into "steaks" about 3/4 inch thick. Serve with the sauce.